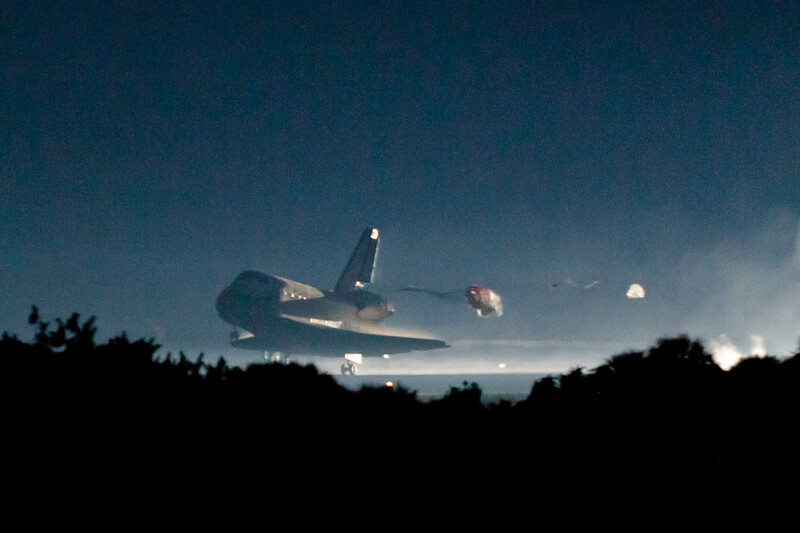 The space Shuttle Atlantis touches down at the Kennedy Space Center in Florida at 5:57 am EDT, bringing to a close the STS-135 mission and 30 years of American space flight endeavor as the Space Shuttle Program itself comes to an end. Only a short while earlier this orbiter, with its crew of four astronauts, had been tearing through the Earth's atmosphere, maneuvering to brake its speed as it reached temperatures of nearly 3,000 degrees Fahrenheit (1,649 degrees Celsius) along its leading edge surfaces. Now traveling a little over 200 mph the shuttle deploys its drag chute and opens the drag flaps on its vertical fin, to create aerodynamic drag that will help slow it down.